Sunday July 25th saw the Annual Mixed Doubles Tournament taking place at Chiswick Tennis Club with 30 players turning up to enjoy the Tournament organised by Pete Griffiths, the newest addition to the Club’s coaching team. Pete’s experience and enthusiasm ensured a most enjoyable and successful day was had by both players and spectators. Fifteen pairs played the first round – with three games of 20 minutes each, and the top two pairs went through to the Quarter-Final, whilst even the losers were able to enjoy and compete for the ‘Plate’ and so despite a wide array of levels everyone was able to play competitively. 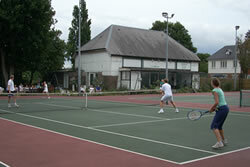 The Final saw shot-making brilliance from all four players, but Louise Burdette (former South-East England Ladies’ Champion) and Tim Beeson, outmatched Charlie (Tim Henman’s cousin) and Felicity Billington, to win the 2009 Annual Mixed Doubles Championship. The Final was a breath-taking single setter, lasting 45 minutes. At 5-4, with Charlie serving for the title, Louise & Tim saved 4 match points at 5-4, and managed a crucial break, pulled off a thrilling win with a final score of 7-6.